Often, business launches resource-intensive occupational healthcare projects to comply with regulatory and policy requirements. It’s far more easy and cheaper to have such system implemented in order to reduce workers compensation claims. But how about to begin putting such systems really to good use? You can make a substantial benefit for your business and don’t have a missed profit. As a proof of my words, there are some telling results of a cost–benefit analysis of the occupational health and safety project conducted at an industrial company. After implementation of the relevant occupational healthcare system, total treatment costs of injuries to workers have decreased to 91%, an annual labor cost savings of company has increased to 75%. The complete return on investment for the OHS measures over a 5-year time period was positive. Among other benefits of Occupational Health Initiatives are the enhancement of organization’s reputation and credibility, maximizing the performance and productivity of employees, increase of compensation cost savings, enhancement of employees’ commitment to the team/organization as a whole, building a more competent, happier and healthier workforce. There are different approaches to implementing OHS projects and optimizing working environment within the company. As an example, you can embed an IoT solution – a hardware & software suite, providing behavior-based support for the workforce via collecting various data of the employees’ working environment. 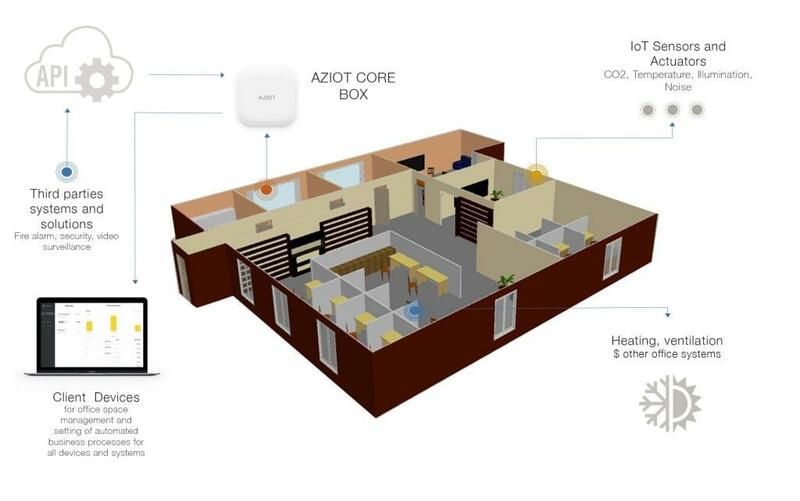 It provides measuring, monitoring and collecting data about office indoor environment and thus furthers improvement of the specific environmental factors via users notification on critical sensors’ indications. monitoring and forecasting of electricity consumption by conditioning system as well as by each office node. Thus, the solution increases self-awareness of employees as for state of the office environment and provides office-management stuff with a real-time tool for immediate office management and control. proactively implement changes to working environments to better serve the workforce. among other benefits, it reduces costs for building heating and conditioning, as well as gas & electricity consumption and CO2 emissions. Such solutions are of a huge importance for companies struggling to enable their employees to be more productive and also get visible benefits for business.